A mother and her six sons from upstate New York forwent haircuts for years, growing their locks out to incredible lengths -- all for an extremely worthy cause. 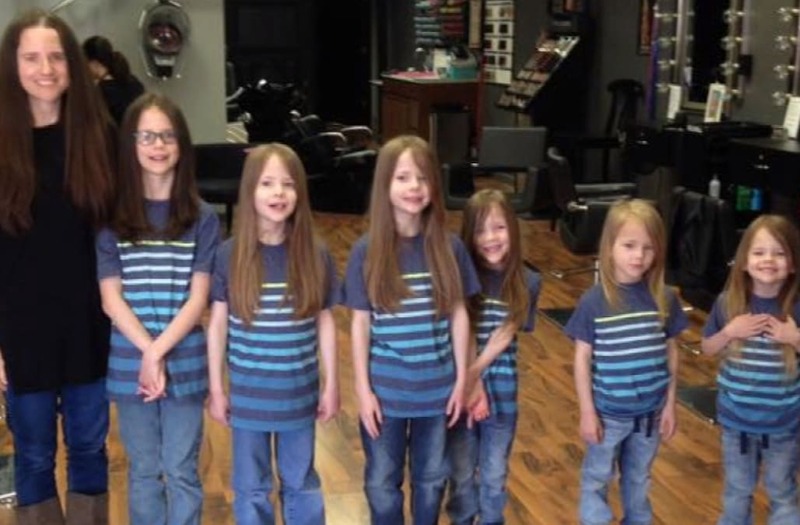 Phoebe Kannisto, along with her sons Andre, 10, 8-year-old twins Silas and Emerson, and 5-year-old fraternal triplets Herbie, Reed and Dexter, donated a total of 17 feet of hair to Children with Hair Loss, an organization that provides hair replacements for kids with medically-related hair loss, on April 24. For the Kannisto clan, this organization hits extremely close to home. "Three years ago, my friend lost her son to cancer," Kannisto told HuffPost. "He was a twin and very close in age to my twins." Unfortunately, Kannisto said her sons have been badly teased over their long hair ever since they started growing it out for the massive donation. "One son has been teased more than the others," she told HuffPost. "He and I have had many tear-filled conversations over the last several months. He explains the process of hair donation to his peers, and some of them just don't get it." But despite any bullying they've been subjected to, all of Kannisto's sons say they'd gladly grow out and donate their hair again -- next time, they just hope their 2-year-old sister, Marah Taylor, will have hair long enough to join them.